This lightweight Rio™ Top excels in protecting you at a value-oriented price. 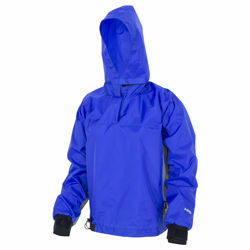 Wear it over insulating inner layers to stay dry in splashy conditions. Waterproof, durable urethane-coated 210 denier nylon oxford is cut big to allow layering for extra warmth. Soft neoprene neck and wrist closures comfortably help keep water out. The waist includes a shock cord with a barrel-lock closure. A great value for all paddlers.